Fabricated from 12 gauge cold-rolled steel, secondary connection cabinets are safe and secure. The outer structure is sturdy enough to withstand any human intrusion as well as environmental elements. Hinged double doors with handles are secured using padlocks to restrict access. Xcel Energy, the primary energy provider in the Greater Denver Area, has approved the use of secondary connection cabinets among its customers - thanks to our rigorous quality assurance processes and adherence to the established safety standards. You can get cabinets rated for 1200A, 2000A, 3000A or 4000A with a short-circuit rating of 100kAIC@480VAC. Depending on your unique needs, you can also choose different configurations including: single-phase/three-wire, three-phase/ three-wire and three-phase/four wire configurations. The enclosure provided by secondary connection cabinets significantly improves a building’s general appearance by concealing all of the electrical wiring. You can get a cabinet in a color that matches the building paint theme- thereby meshing with the overall aesthetics. Get in touch with us for more information on secondary connection cabinets. Having extensive international experience, Denver-based Easter Owens offers over 60 years metal fabrication experience and services. 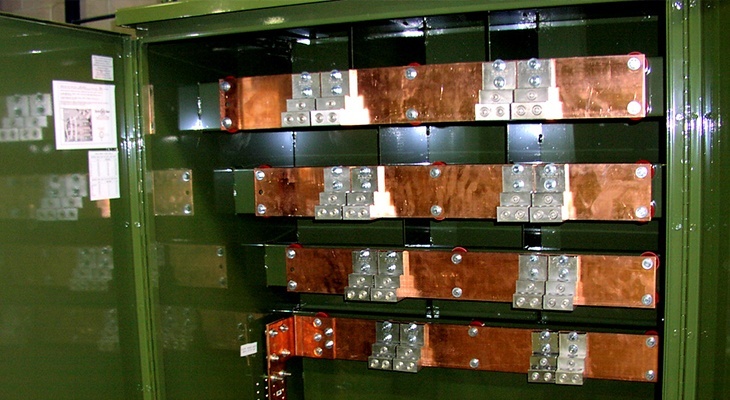 Specializing in power distribution equipment, custom metal buildings, industrial control panels, electrical enclosures, and security electronics, Easter-Owens prides itself on providing high-quality material, along with personal customer service. Have Questions About Metal Fabrication Services? Contact Easter Owens with to speak with a representative or to request a quote on your next project.